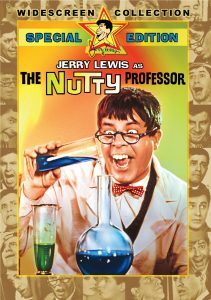 The Nutty Professor is Jerry Lewis‘ most famous film, and with good reason. Unlike many of his comedies, this is more than a thin plot for him to hang slapstick on. 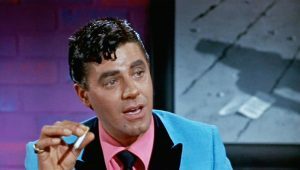 The character of Dr. Julius Kelp is well-rounded and sympathetic — as well as the traditional klutz that Jerry Lewis portrays so well. The ultimate nerd, he’s physically humiliated in front of his class. So, he tries several (very funny) attempts at building himself up, only to fail miserably. Kelp then turns to his knowledge of science to create a formula to turn himself into the macho he-man that he dreams of being. All in hopes of earning the affections of Stella Purdy (played very well by Stella Stevens). The potion works all too well, releasing the suave, self-confident, arrogant and conceited Buddy Love. Whereas Kelp is barely tolerated, Love alternately bullies and sweet-talks his way into favor. The scene with him buttering up the college president, played by Del Moore, is wonderful. Until the end of the picture, when the formula wears off at the wrong time. The ‘Hyde’ Buddy Love slowly turns back into ‘Dr. Jekyll’ Julius Kelp. In front of the world, all while giving a wonderful speech that everyone should hear. The DVD has the ordinary extras (trailers, outtakes) as well as a very nice documentary on The Nutty Professor, both the making of it and afterward. According to one of the trailers for this film, “We don’t care if you blab about the beginning of this picture; nor do we care if you give away the ending; but we do care if you reveal the middle. 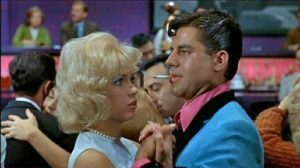 In fact, Jerry Lewis urges you to see this picture from the beginning, on penalty of losing your popcorn privileges.” This spoofs Alfred Hitchcock’s dictum that Psycho (1960) had to be seen from the beginning and his insistence that no latecomers be seated (“not even the [theatre] manager’s brother”).